Claude Heath’s method of artistic representation is to hold an object out of his sight and then to draw that object using only the sensory information that he has gathered by touching it. The results are always startling and never follow the expectations that one has when comprehending the object visually. Even more intriguing has been Heath’s work with objects that were themselves transformations (such as a flint adze, once used to break up the soil and thus to transform the ground 6500 years ago). Here Heath used the object of his artistic practice itself to create another level of transformation. 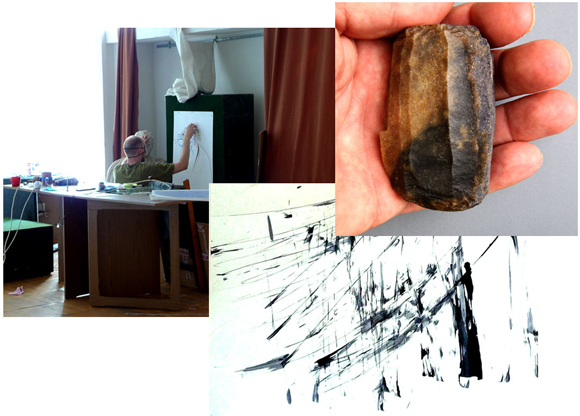 In this case, instead of using a pen or pencil to make a blind drawing of the adze, Heath used the adze itself to make the transformation, by utilizing the adze (as a pen of sorts) to cut the paper that had been intended to bear the image. Claude's art residency took place in the Muzeul Judeţean Teleorman in July 2009 and the outputs produced contributed to the Măgura Trecut şi Prezent expoziţie at the Muzeul Judeţean Teleorman. Visit the Mass-media - Desene section to see Claude's desenarea obiectelor.